Shallots are part of the onion family but are much smaller. They do not have the rings like onions, but are sectioned in cloves. They possess a strong rich flavor, which tastes like a combination of onion and garlic. Shallots have coppery brown skin, pinkish, or greyish brown. They are great in salads, and in dips. The shallot has a tapered shape and a fine-textured, coppery skin, which differentiates it from onions. Wine complements: White wine like reisling, Chardonnay. Choosing: Shallots are generally available year-round, but prime time is from April through August. When selecting shallots, think onions. The shallots should be firm and heavy for their size, not dry and light, and should have no soft spots. Sprouting shallots are an indication of age and should be avoided. The younger (smaller) the shallot, the milder the taste. Large shallots will smell and taste more like their onion and garlic cousins. Buying: You can buy Shallots at local markets. They are available at Farmer's Markets starting in July through September of October. 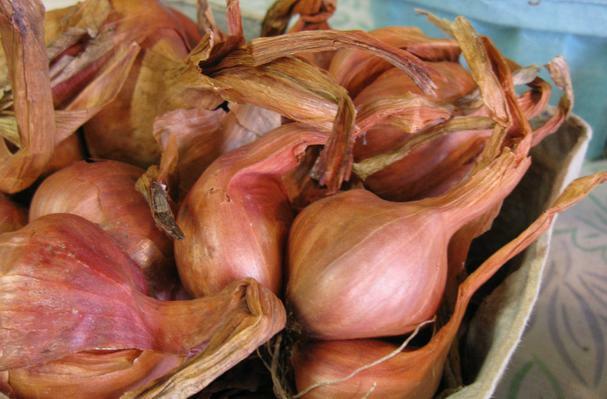 Procuring: Shallots can be grown from seed, but usually small bulbs are planted in late fall or early spring. The "mother" bulbs divide forming several bulbs. Although shallots are mostly thought of as dry bulbs, in some areas the green shoots of shallots are used similarly to the green onion or as a scallion substitute. They grow in clusters, where separate bulbs are attached at the base and by loose skins. The shallot has a tapered shape and a fine-textured, coppery skin, which differentiates it from onions. Shallots may be chopped and frozen up to 3 months. However, when thawed, they will have the texture of a lightly sauteed shallot, so do not expect any crunch. This may actually be a time-saver in many recipes. Cleaning: Peel away the papery exterior and use according to your recipe. Most cooks buy only as many shallots as they will need for a particular recipe, but if you have an abundance of shallots, store them as you would any allium in a cool, dry, dark place with plenty of air circulation. Knot them in clean pantyhose, hang from the ceiling in a dry garage, cellar or closet, and they can last up to 2 months. Or store in a hanging metal mesh basket. If they sprout, you can still use them. Remove the bitter green sprouts if you don't want a strong onion flavor. Many cooks choose to include the sprouts and use them much like chives. Shallots store well at temperatures of 0–2°C and 60%–70% relative humidity. Because of their small size, shallots tend to pack closely; so they should not be placed into deep piles. Store shallots in slatted crates or trays that allow good air movement in and around the bulbs. This is important to remove excessive moisture and to minimize storage diseases. Low relative humidity and low temperatures are important to keep shallots sound and dormant and free from sprouting and root growth. At humidities much above 70% and at warmer temperatures of 5–8°C more of the shallots will sprout, develop roots, and decay. With good air flow and humidity control, shallots should store for 8–10 months. * Recent studies have proven the fact that out of all the varieties of onions, shallots are particularly effective against liver cancer cells. Shallots contain 6 times more phenoplast than onions. It helps the liver to remove toxins from the body and have glucosides to inhibit and kill cancer cells. * Shallots are also helpful in inhibiting stomach cancer. Regular intake of shallots can help the stomach stay away from any kind of stomach infections. * Shallots are very good for patients who have symptomatic atherosclerotic disease, cardiovascular disease, heart attacks and stroke. It produces an anti-coagulant that thins the blood and exhibit strong anti-platelet activity. * Shallots help in lowering the blood sugar levels in people with diabetes. They prevent the degradation of insulin and increase the metabolism of glucose. * Shallots also aid brain functions and are very effective against Alzheimer’s disease. * Shallots contain sulfur contents that can make the skin look younger. Daily shallot intakes will be extremely helpful for you in the long run. * Daily consumption of shallots helps in the growth of bone tissues and it also reduces the risk of developing osteoporosis by 20%. It contains Prostaglandin A-1, a powerful agent that can lower blood pressure. History: Shallots are called 'bawang merah kecil' (small red onions) in Bahasa Melayu, an official language of Indonesia, Malaysia, Brunei, and Singapore, also called Brambang in Java, and "hom" (หอม - literally "fragrant") in Thai. In Cambodian (Khmer) literally called it "Katem Kror Hom" where "Katem or Ktem" is a species of Onion and "Kror Hom" or "Hom" is meant RED describing the colour of the onion, which roughly translate as "Red Onion". In South East Asian cuisines, such as Thai, Cambodian, Malaysian and Indonesian cuisines, both shallots and garlic ('bawang putih', white onions) are very often used as elementary spices. Raw shallot can also accompany cucumbers when pickled in mild vinegar solution. It is also often chopped finely, then fried until golden brown, resulting in tiny crispy shallot chips called 'bawang goreng' (fried onions) in Indonesian language, which can be bought ready-made from groceries and supermarkets. It enhances the flavor of many South East Asian dishes, such as fried rice variants. Crispy shallot chips are also used in Southern Chinese cuisine. In Indonesia, sometimes it is made into pickle which is usually added in variable kinds of traditional food. Its sourness increases one's appetite. It is widely used in the southern part of India. In the Kannada language it is known as 'Eerulli' and used extensively in snacks, salads, curries and rice varieties. It is called 'Chuvannulli' in Malayalam and is used in Sambar (a type of curry) and different types of kuzhambu (curry).